Diamonds are one of the world’s most sought-after gems, and those born in April are lucky enough to call this scintillating gem their birthstone. Here are a few April-born celebrities who rock their birthstone in true Hollywood glamour and style. Actress Kirsten Dunst said 'yes' to Jesse Plemons with this gorgeous oval-shaped diamond mounted in yellow gold and complemented by stones on each side of the band. It is estimated to be 3 carats and valued around $80,000. Actress Jessica Alba's beautiful 5-carat asscher-cut diamond ring from husband Cash Warren is surrounded by a dazzling diamond halo and side diamonds. Ben Affleck wooed actress Jennifer Garner with this breathtaking 4.5-carat cushion-cut diamond on her 33rd birthday. The gorgeous sparkler is designed by jeweller Harry Winston and is worth an estimated $500,000. Snapchat mogul and CEO, Evan Spiegel, popped the question to Victoria’s Secret Angel, Miranda Kerr, in August 2016 in Paris. The exquisite 2.5-carat traditional round-cut solitaire diamond ring with tapered baguettes is the perfect design to complement to her chic and effortless style. The First Lady of the United States dazzled everyone with a 25-carat diamond stunner on her left hand in her official portrait photos. President Donald J. Trump gave her the ring as a gift on their 10th wedding anniversary in 2014. It is estimated to be worth an incredible $3 million. Known as the King of Birthstones, diamonds were once reserved exclusively for royalty and their incredible shine and luster have captivated wearers for centuries. They symbolise enduring love and commitment as well as invincibility, strength and endurance. The name “diamond” is derived from the Greek word adámas, meaning “unbreakable” and they are thought to provide the wearer with great inner strength for they were developed deep within the Earth over three billion years ago. Less than 20 percent of the diamonds mined worldwide are true gem-quality, making them extremely valuable and rare. The ancient Romans and Greeks believed that diamonds were the tears of the gods or splinters that had broken off of falling stars. It was also stated in Roman literature that Cupid’s arrows were tipped with diamonds. Since diamonds are the traditional and modern April birthstones, diamond jewellery is a perfect birthday gift for someone you love, especially if their birthday falls in the month of April. Whether it’s a diamond ring, diamond earrings or a diamond necklace or pendant, a diamond birthstone provides the wearer with a beautiful, personal and lasting piece of jewellery that will be cherished and remembered for a lifetime. 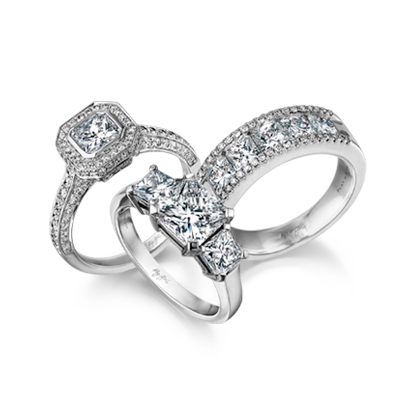 Visit Shimansky to view our timeless collection of April diamond birthstone rings and other April birthstone gifts for your loved one.